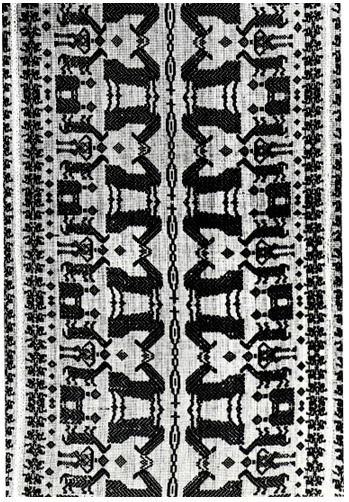 This blanket is woven using the dinapat style. Dinapat denotes “full” or “total” referring to the design that occupies the whole blanket. Motifs include human figures, small horses, carabao calves and large deer. The design is highly valued, and the blanket used for death ceremonies. The finite pattern occupying the center of the blanket has symmetry group D2. The frieze patterns adorning the sides of the blanket have symmetry group mm. There is a horizontal reflection and vertical reflections with axes spaced half the translation length.